When Harvard University (14-10, 10-4 Ivy) lost to Yale on Friday and Dartmouth beat Brown (10-16, 4-10 Ivy), there was a three-way tie between the Big Green, Princeton University (15-8, 10-4 Ivy) and Harvard with one game in the season remaining. With the loss against Yale, Dartmouth finished its season tied with Yale for third in the conference standings. 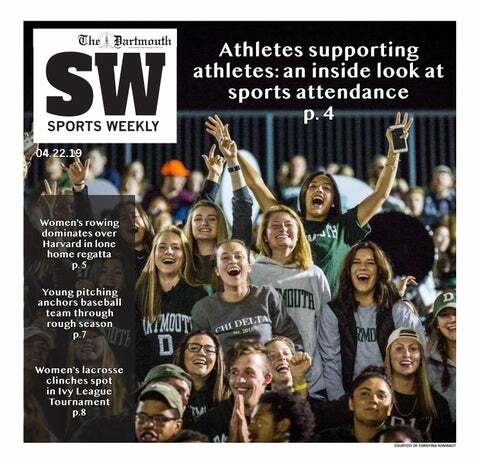 “This is my favorite season I’ve had at Dartmouth not only because we got so far, but because I felt that the team had reached a point we had never had in the past,” Paige Caridi ’16 said. Playing in Providence, Rhode Island, Dartmouth took care of business, defeating Brown in a tight match. After dropping the first set, the Big Green took the next two but was unable to close the match in the fourth, sending the contest to a deciding fifth set. Dartmouth held off the Bears to win 15-10 in the final set and keep its hopes of a title alive. For the first time all season, Dartmouth played two consecutive five-set matches as its season finale clash against Yale also went the distance. Despite all of the exhausting time spent on court, the Big Green appeared poised to finish the Bulldogs on their own court in the fifth as Dartmouth opened the set strong with a 4-1 lead that continued on to a 9-5 lead in the abbreviated set. At that point, however, a hint of doubt crept into Dartmouth’s game as the women struggled with their passing and failed to generate stops, leading to a 7-0 run by the Bulldogs that effectively turned the tide of the game and saw Yale lead 12-9. The Big Green fought to reduce the deficit to 14-13, but Dartmouth was unable to force the final set into sudden death as Yale sophomore Kelsey Crawford registered the final kill to end the match. The final loss extended Dartmouth’s drought without an Ivy League title, an end result that overshadowed much of the success that the team has had this year. Since the creation of the conference in 1977, Dartmouth has never won the Ivy League title. After a stellar start to the season, the team appeared ready to rewrite history, but faced some difficulty in the heart of the conference schedule, losing three games in a row. “Overall, it was one of the best seasons, and we did the best of any other Dartmouth team so that was really amazing,” said Emily Astarita ’17. After finishing 4-10 against Ivy League teams last year, the volleyball team made a massive improvement this year with a 9-5 record, establishing the Big Green as a serious threat in the conference. “We were really determined this year and our goal was to be in contention for the Ivy title, and we did that,” Kaira Lujan ’16 said. The graduating Class of 2016 was the first class of recruits for head coach Erin Lindsey, and the program has continued to grow tremendously since her arrival. With the season officially over, the only thing the team can do is prepare for the coming year, which holds high hopes and expectations.